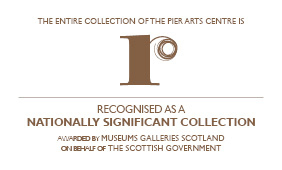 We will be holding the third of four Study Groups for those keen to take a more in-depth look at Pier Arts Centre collection and exhibitions on Thursday 21 August, 7.30-9.00pm. There will be a walk and talk around the current exhibition GENERATION - 25 Years of Contemporary Art in Scotland Orcadia & Other Stories - Walker & Bromwich followed by an informal discussion and cup of tea. Prior booking is requested. Next session 18 September. To book a place of for further information contact the gallery on 01856 850209.